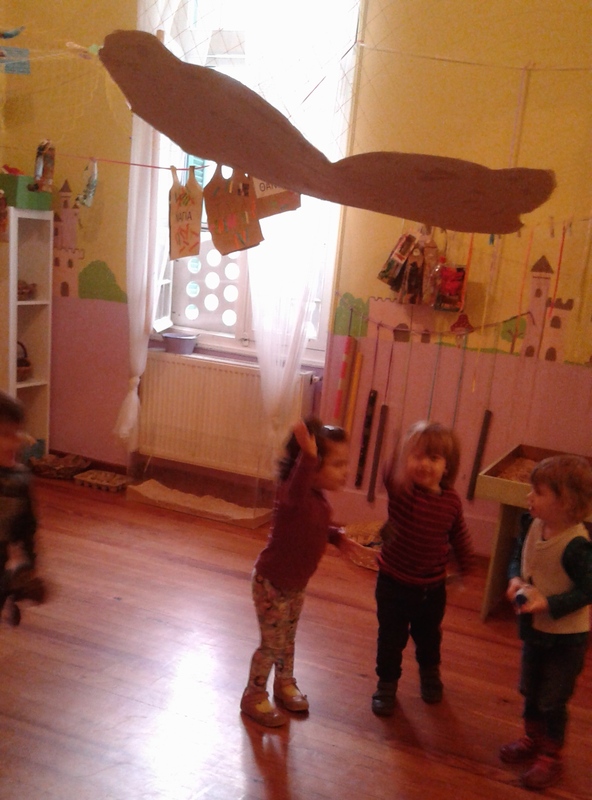 One day Eleni, Thanasis and Mirto while playing in class, looked up and saw a cloud. “Wow, let’s bring it down here”, Eleni said. But that wasn’t so easy. 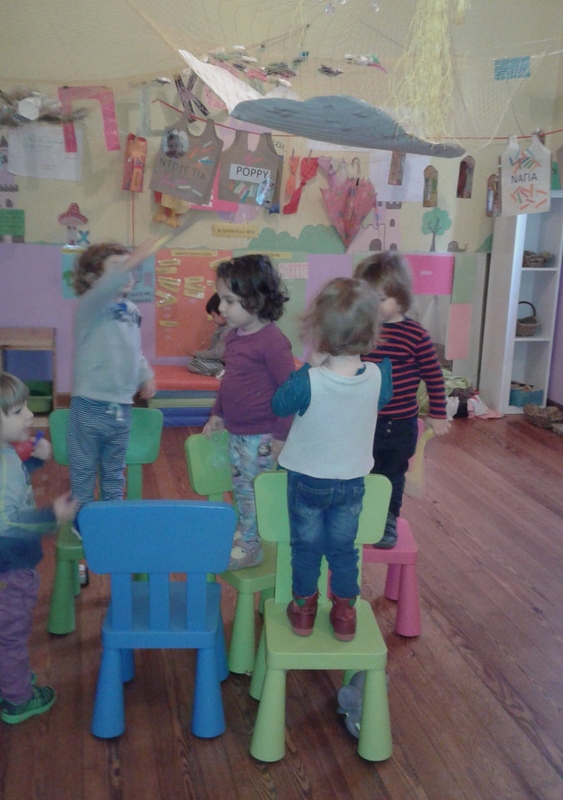 Children raised their hands, but understood they weren’t tall enough. Then, Mirto had another idea. 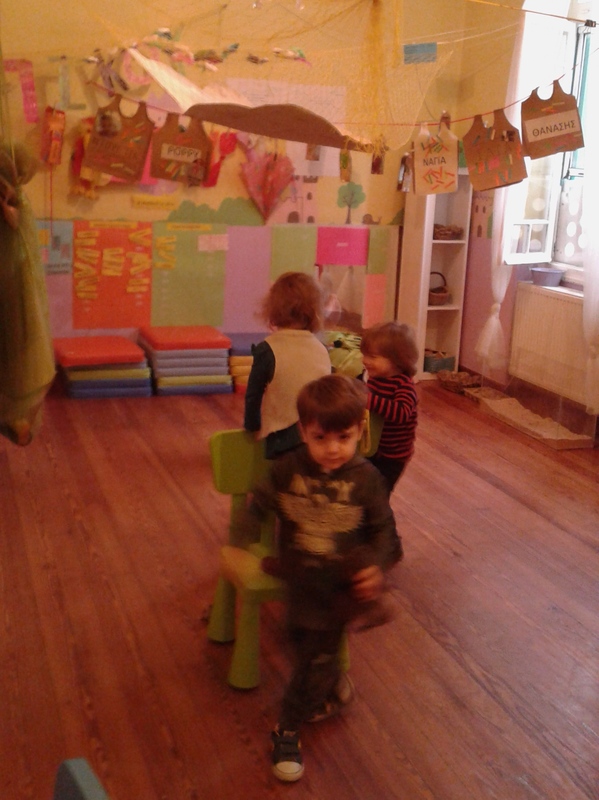 She grabbed a chair and climbed on, and rest of the kids followed. The cloud was still away. Kids tried and failed again. They didn’t managed to bring down the cloud. But it didn’t matter, at all! The most important was that they didn’ t ask me for the cloud. 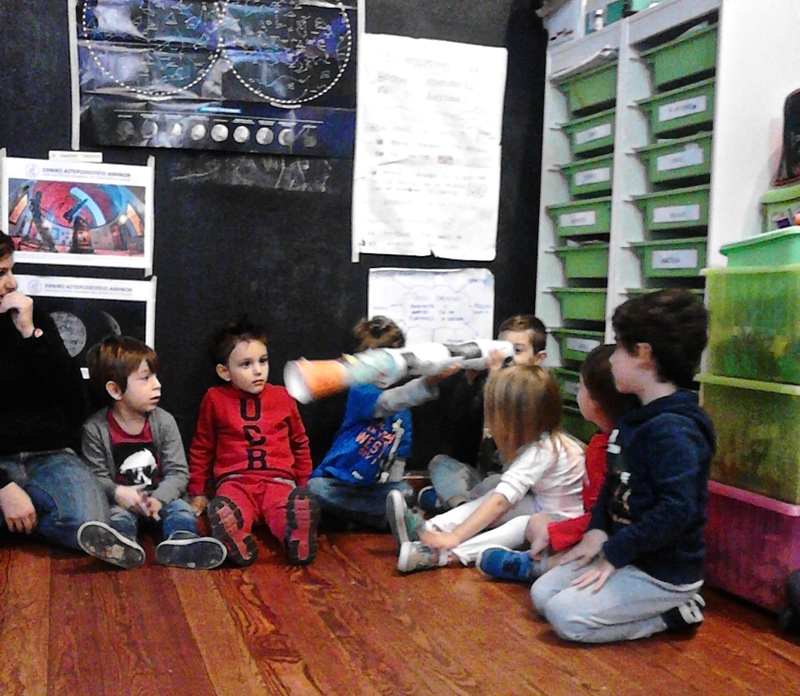 Children did the whole thing just by themselves, shared so many ideas using words and tried everything they believed could help them accomplish their purpose. 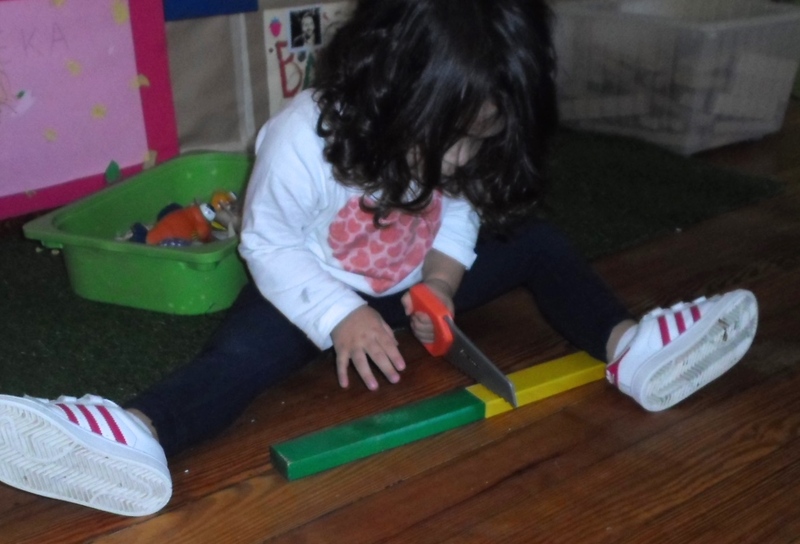 In free play time, Cynthia took a wooden block from building corner and a handsaw. First, she tried to cut the wooden block with handsaw. 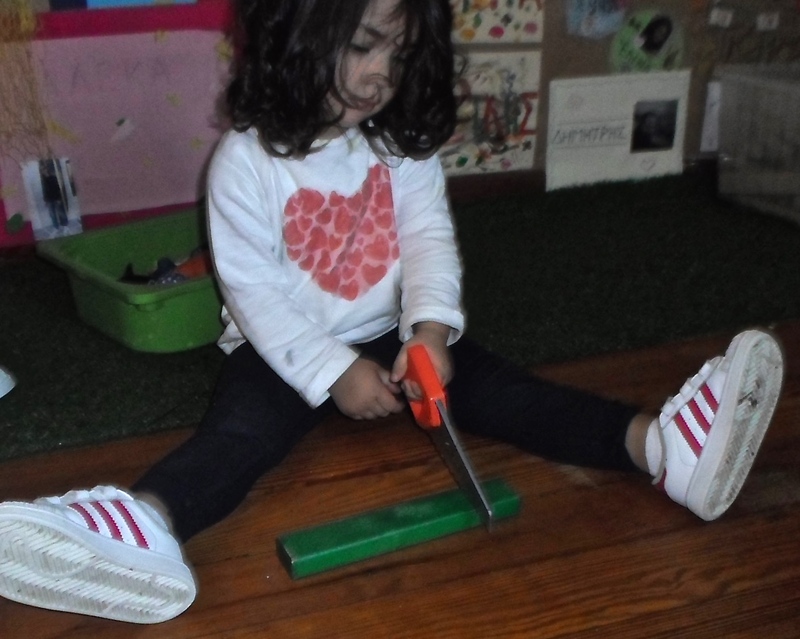 But then, she thought twice and realized that it would look real if she put together two wooden blocks and pretend to cut where the two pieces come together! 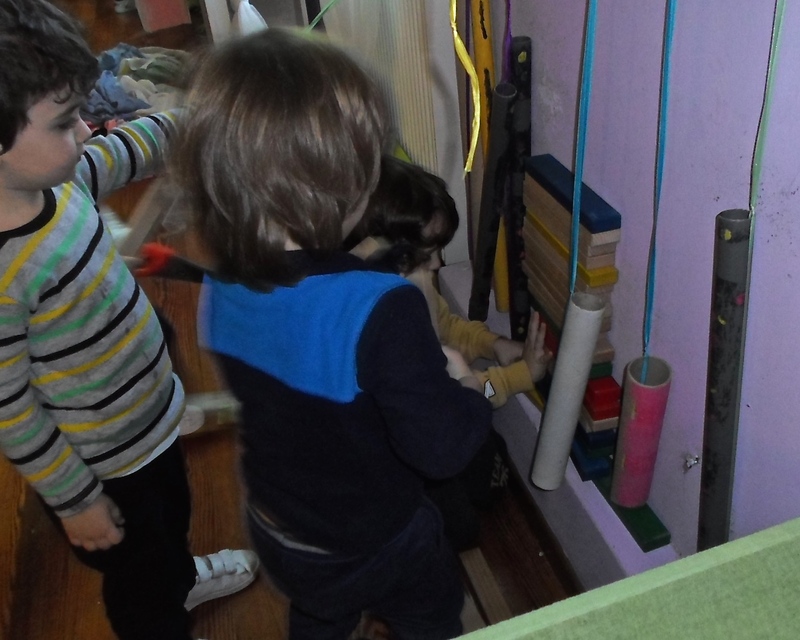 More children started participating in her activity, by stacking blocks against the wall and creating a spontaneous workshop. 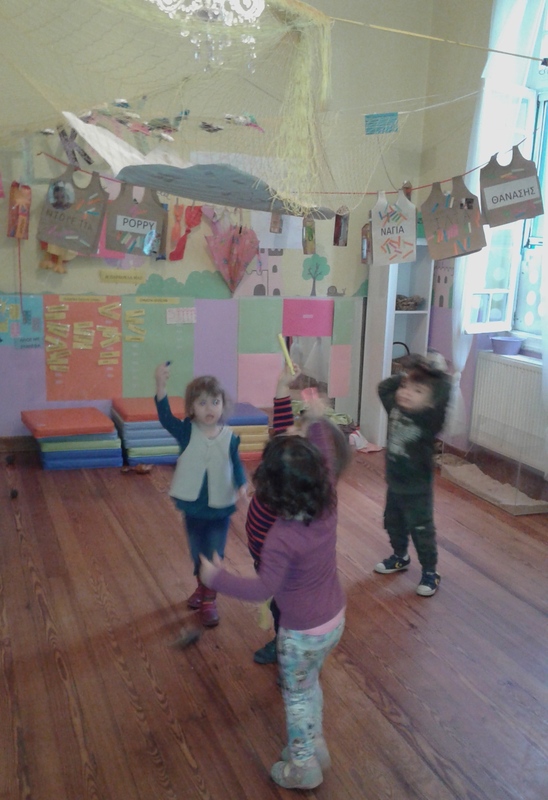 It was a symbolic play children started themselves and which helped them further develop their imagination, creativity, fine motor skill development and cooperation. Plus having fun, of course! 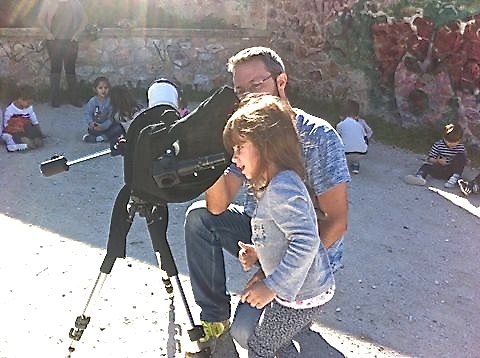 When we looked through our big plastic telescope, we noticed something very strange: everything had turned upside down! 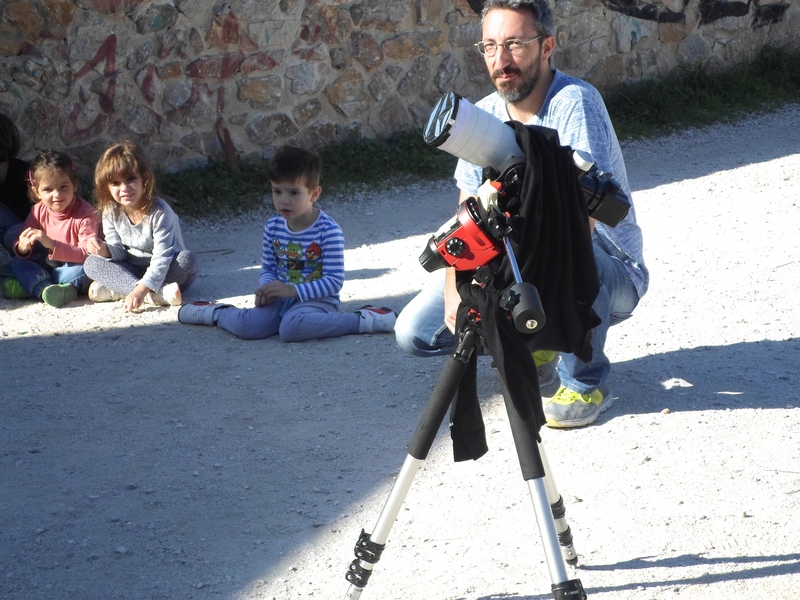 So, we asked help from Yannis, an amateur astronomer! He brought his professional telescope, let us see the sun through it and answered all our questions. 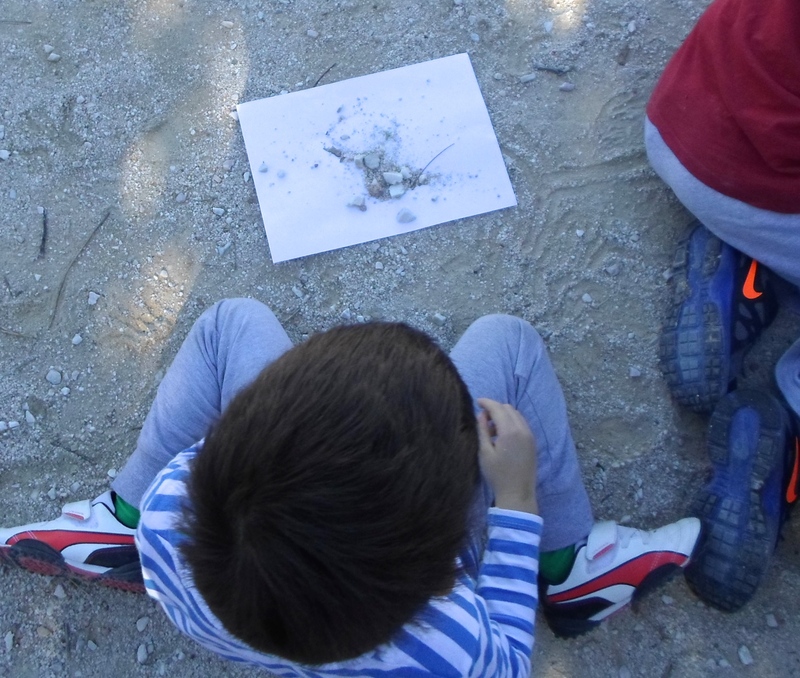 Children grabbed the opportunity to make constellations on the ground with sand and small stones. But why not even form the whole universe! During time of free play, I took a roll of toilet paper and cut it into pieces. Then, Anastasia came and asked me what I was trying to do. 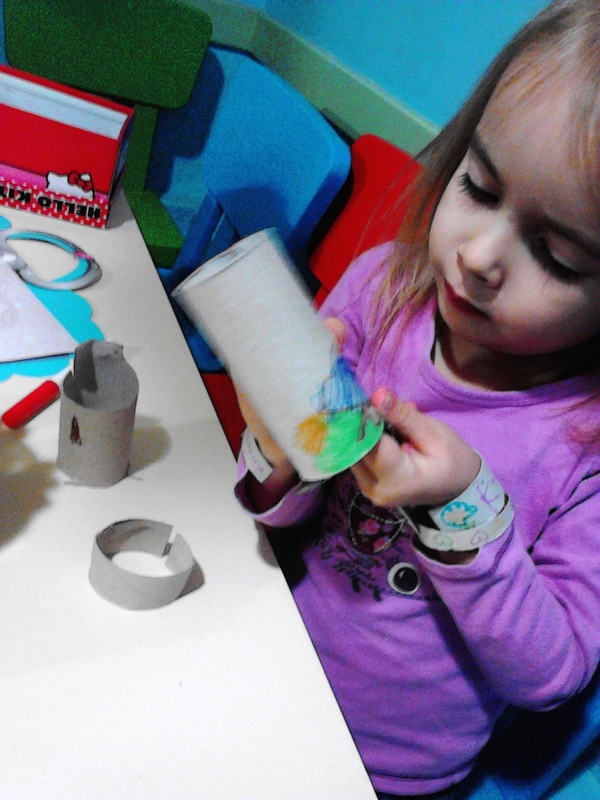 I told her “I’m trying to think what to do with this material, but I can not. Can you help me”? 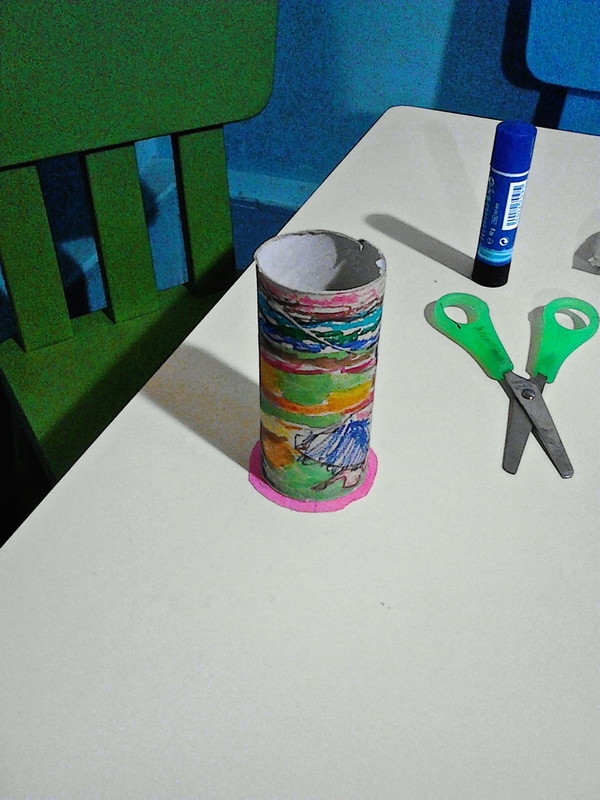 She said we can make a case for pencils using the whole roll. Katerina came at the table and constructed a perfect case! Then another idea came up. 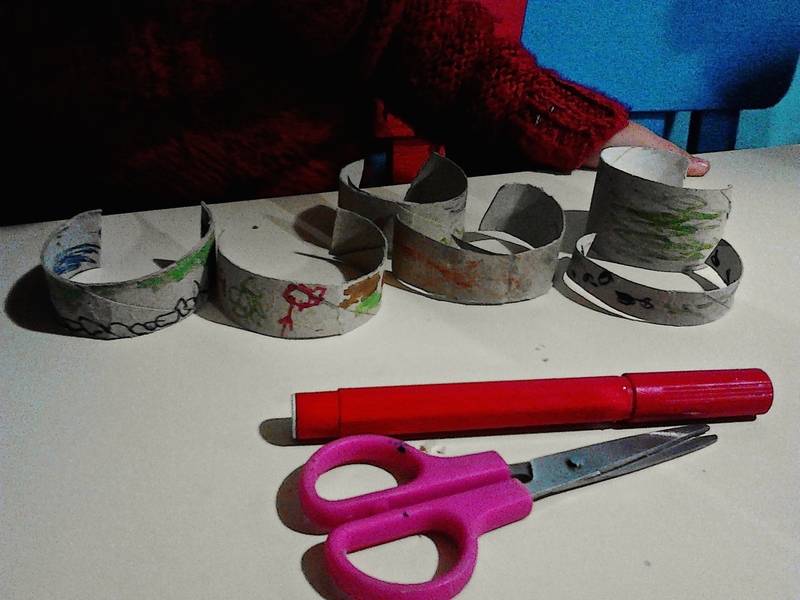 “We can make bracelets with the pieces you cut!”. 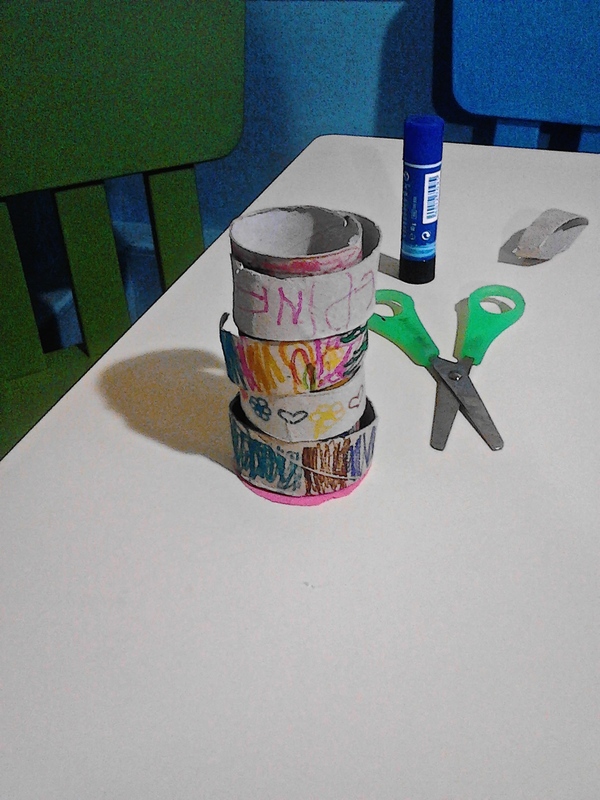 So, Katerina, Artemis, Emily and Andriana made lots of beautiful bracelets. Katerina said “hey, my case can also be used as a hanger for the bracelets! 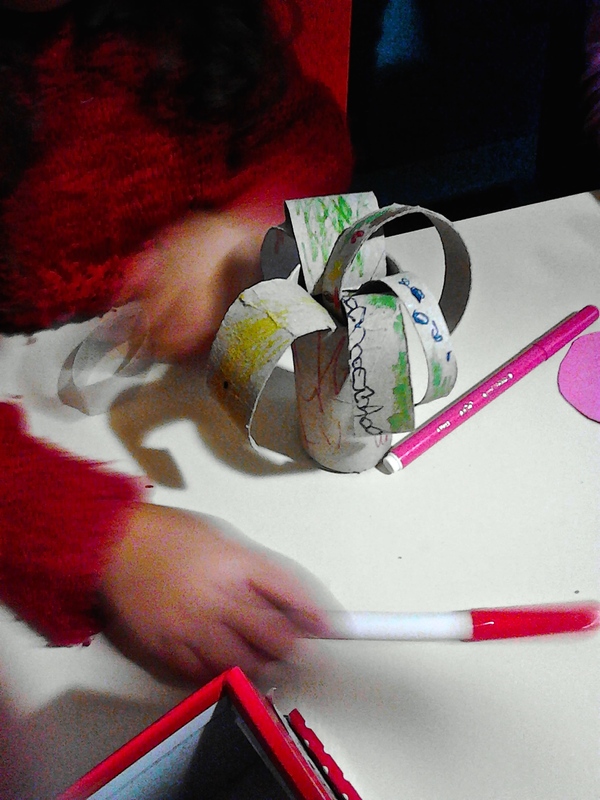 Emily had another idea, and made a nice palm-tree! 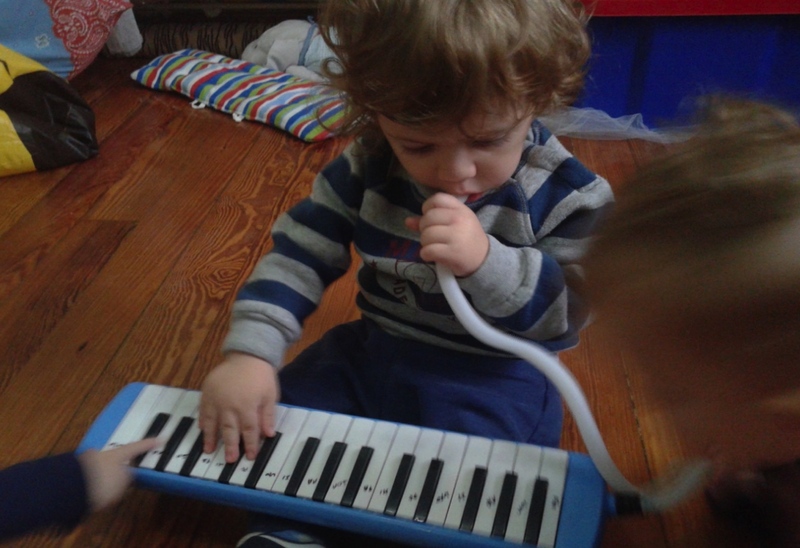 In our babies class, we love to sing and play the melodica. Children get excited on music and show great interest in this specific musical instrument and the sound it produces. 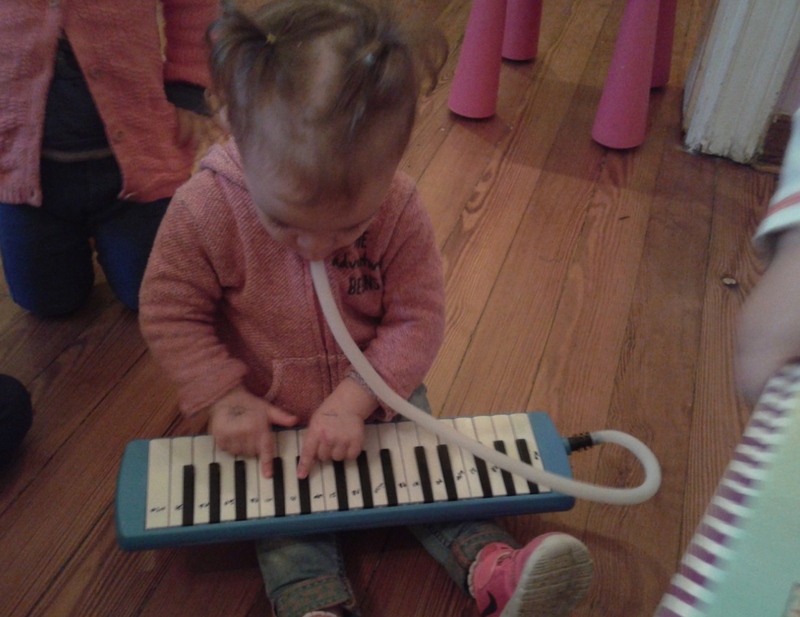 Today, after singing our song, they played the melodica themselves. And the result? Spectacular! Just like young musicians, the blew the instrument and pushed the buttons. Some even managed to produce a nice sound! 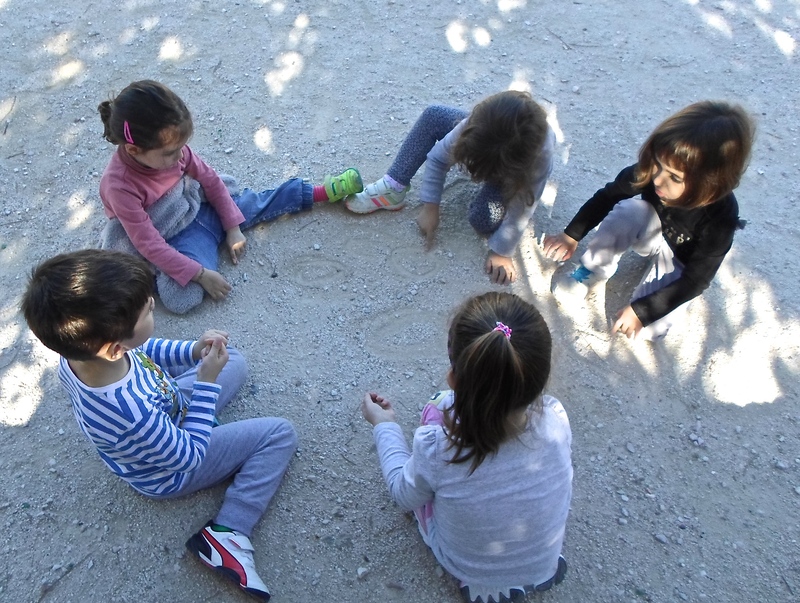 As a result of this playing, attention and memory of children was stimulated and practiced their control and coordination skills. 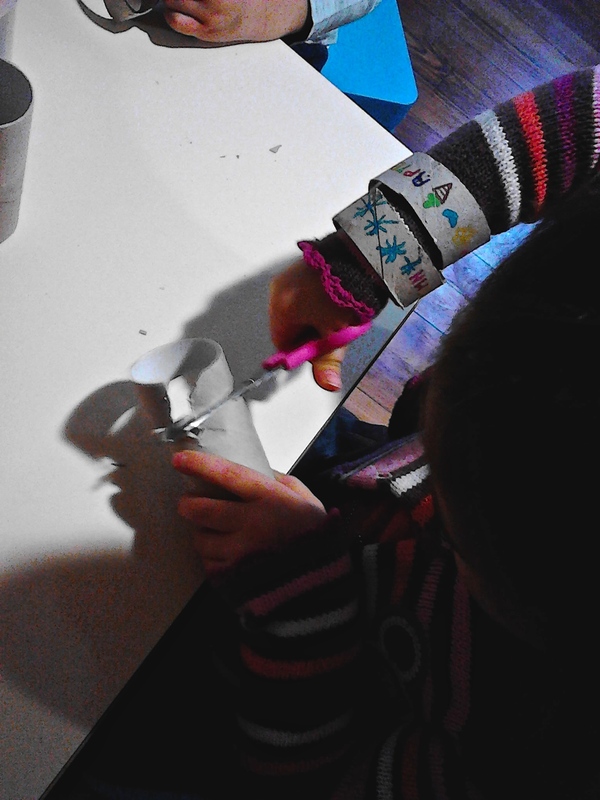 But most of all, this experience provided children with the ability to express themselves and have fun! 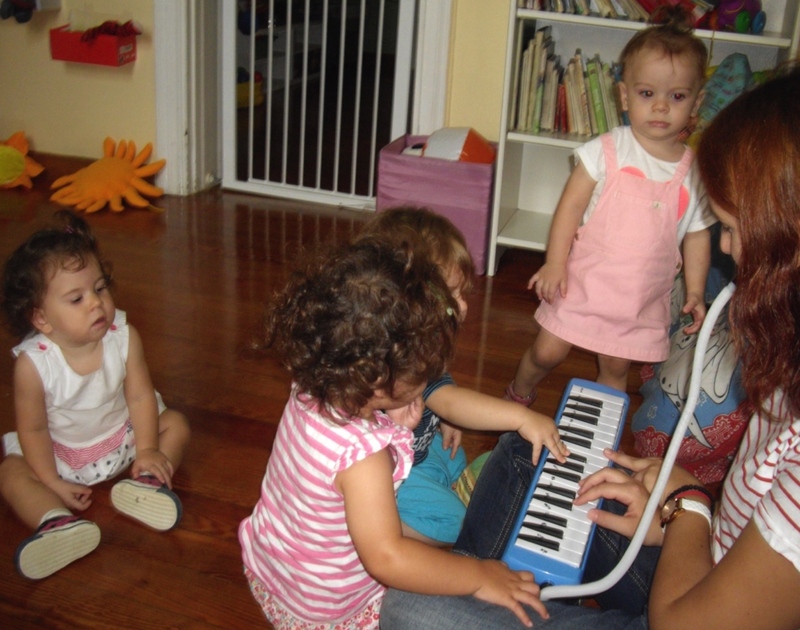 Music is always an excellent tool for babies to discover the world.